I got to say, this camera is Superb, probably one of the best FPV camera I have used to date! 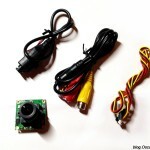 Image quality is just great for FPV. I flew directly into the sun, and everything else is still visible. Flew into the forrest, and wide range dynamics works well, and lighting adjustment kicked in very quickly. Here is some footage of this camera. I will be getting this camera to mount it with a TX on a small assembly I can attach to various quads/cars/etc. maybe try one of the new 40ch Raceband TX :) 200mw is pretty decent, espeically for group flying ! there is a button you can push to change channel, very handy! I am using it and love it! Also look for FX799T, they are basically the same unit just different brand. I also happen to live in China. Let me know if you need a Taobao link for this camera (just got mine yesterday), as you mention you were looking for it a few months back but were worried you couldn’t find it. And while I figure you found it, never hurts to offer if you haven’t. Hi Oscar, I recently ordered this camera and really like it too! I opted for the metal housing, and it was much lighter than I expected. My only complaint was that the pivot comes loose easily over time and you will be looking down at the ground every time after a crash. I haven’t changed any of default settings yet, but I will try your recommendations. Great post. Thanks! Hi special issue when combined with Osdoge, like Flickering ….? So… if one ordered the camera without the IR filter, I know you’d get better low light performance- but what would you see during the middle of the day? I end up flying after work, and as sunset comes earlier, flying into dusk is a possibility. Just wondering what I’m giving up if I then fly during the day on weekends. Worse contrast, maybe? Hi Oscar, little correction: “standard” board dimension is 32mm (not 34mm as you wrote). Old PZ0420 has 38mm board and it’s optionally breakable to 32mm. thank you Pavel, I guess I was confused! Corrected now!